Creating your very own GPS system for cars is really a lot easier than you think. In days long past you would to have had a hell of a lot of technical experience, a great understanding of how to create software, and a lot of money to get something like real-time GPS tracking to work for yourself. You would have had to buy a ton of equipment that you would never normally use and spend countless hours coding software and making firmaware so that your devices could interact with your software. This process would be both time and money intensive and very few of us would be able to get through it. Today, it is a totally different story. All you need to create an awesome, real-time GPS tracking system for your car is a navigational GPS that has bluetooth capabilities and a cell phone that can run a free GPS tracking application called 3dtracking. It will also help to have a good cell phone plan with your provider that has plenty of data sending capabilities. That is it. The very first thing that you are going to need is going to be a GPS navigation unit. This is because the 3dtracking software must have access to coordinates generated by a GPS device in order to provide real-time GPS tracking information. Without some form of GPS information to feed your cell phone that is loaded up with this free GPS tracking software you are not going to be able to get yoru desired results. If these prices are still to high for you personally then you might want to consider trying to find a refurbished GPS. A refurbished device can sometimes come at a very steep discount (from 20%-50% in some cases) and it should work just as well as a ‘new’ device. In some cases you won’t even need to own a stand alone car navigation GPS for this system to work. If you own a phone with GPS tracking capabilities already installed into the phone then you don’t need to connect to an external GPS device via Bluetooth. Everything that you are going to need is going to be inside the case of that cell phone. Some of these phones are rather inexpensive (some can be found for under $20) while others will cost over $200. Which phone you choose will depend largely on your needs for the cell phone and whether or not you want to use it for more than just GPS tracking. Once you have one of these phones you are going to want to make sure that you have a good data plan for your phone. This way you can send data to the 3dtracking servers without incurring exorbitant fees. Right now, AT&T wireless is offering a unlimited data plan for its phones for $35 a month. This would put your access to real-time GPS tracking information for your car at roughly $1.17 per day. In order to download the free 3dtracking software simply go here. There are onpage instructions for what to do depending on whether or not you have a Windows-based PDA or a smart phone. Once you have downloaded the application and installed it on your phone or PDA you will do a brief 3 step application process and will be ready to begin tracking with your cell phone right away. The startup cost of this GPS tracking system for cars can be pretty steep, coming in at over $400 if you buy some of the higher end equipment. With a $35 unlimited data plan that would bring the first year total out of pocket expense to somewhere between $800 and $900. The second year of operation would be $420. While this certainly isn’t cheap, if you already have the GPS navigation unit and the compatible cell phone you won’t need to spend any money out of pocket so your expense will probably be $0 unless you have to upgrade the data plan on your phone to handle the load. Free GPS tracking is certainly better than not free GPS tracking. From where I sit there are two main applications for this type of GPS tracking system for cars. They are tracking a teen driver and snooping on a spouse suspected of cheating. For the former you should be completely up front and honest with your teen about what you are doing to their phone and why you are doing it. They should know that you are concerned about their safety and that you want to make their driving experience as safe as possible. Then you should work on some sensible rewards and punishments for your teen drivers. Making sure they they buy into your GPS tracking system is key if it is going to be useful to them and to you. IF you are tracking a spouse that you suspect of cheating you should not let them know that you are tracking them. To do this, you might have to buy a special phone that you put in their car for them so that they don’t realize what is going on. You will have to leave the phone on and recharge the battery often, but the ability to know if they are cheating or not can certainly be worth the price. There are practically as many things that you can do with this technology as you can dream up, so sit down, grab a beer, and dream. This GPS tracking system for cars is definitely going to blow your mind if you let it. Geocaching is a great way for kids to ditch their video games and TV for an active outdoor adventure. Kids need some type of excuse to get outside and play in the great outdoors. A life of video games and TV has led to high levels of obesity in America when combined with a steady diet of processed food. Our children need to exercise if they are to break the cycle, so finding interesting and compelling reasons to get them out the door is something that parents are going to be looking for at every opportunity. Geocaching combines our children’s love for technology with their need to get outside and DO something. It is like a real life video game, kids must use an electronic device to find a hidden treasure located somewhere around them. The device guides them to their location and helps them navigate the world around them. The can run, or bike, or even walk on their search – all of theses activities are recommended by government orginizations as great ways to improve your child’s health. But there is one catch with geocaching, the GPS devices traditionally used for it are anything but cheap. Devices like the Garmin GPS 60CSx Handheld GPS Navigator and the Garmin eTrex Vista HCx Color High-Sensitivity Mapping Handheld GPS run somewhere above $200 a piece. Sure, they are great devices that can be used for way more than just geocaching, but do you really want to bed dropping that much money on a device that will help your kids play? Savy to this issue, a company and product was create to solve this issue: Geomate.jr. The product is significantly cheaper than the more traditional geocaching alternatives provide by Garmin and other GPS manufacturers. Right now, you can get it for about $70 at REI. The only thing that even really comes close to this in terms of price is the Garmin eTrex H Handheld GPS Navigator , which is being sold four about $85. This is my primary Geocaching GPS. The high sensitivity chip has the same strong processing power, and thus signal sensitivity and position resolution, as any of the more expensive units. It gives me excellent accuracy in areas where my older GPS units just give up, even dense forest cover. If you’re only interested in point to point navigation (geocaching, trail tracks or just finding your way back to the car or the ski chalet), then this unit will do a great job for a no-regrets price. In my opinion, this is going to be the product that you are going to want to compare the Geomate.jr up against if you begin to seriously consider it as a geocaching tool for your child since the price difference is only about $15. So, what are the Geomate.jr’s features? The features that seem the nicest about the Geomate.jr is that the loading of the geocaches is automatic. You don’t need to input the coordinates into your device yourself since they already exist within the memory. This seems idealy suited to kids who might not be familiar with how to input some information into a handhelf GPS navigation device like the Garmin eTrex H Handheld GPS Navigator. But I also think that this feature is also the biggest drawback to this device. Without the ability to add your own caches to the device you run the risk of the Geomate.jr running out of caches for your child to go and find. Do you really want to fork out money for cache updates that you could do for free on the more traditional handheld GPS? I don’t think I would as long as my child was wise enough to be able to input coordinates into the GPS device themselves. It is also pretty important to note that none of these devices are going to let you be able to track your kids with GPS. Instead, they are just there for enterainment purposes. What do you think, is the Geomate.jr worth buying or would you rather go with the Garmin eTrex H Handheld GPS Navigator? The other day I was reading some news and stumbled upon a story that had a lot to do with what I talk about here – GPS for kids. On January 3, 2009 Natalie Maltais, a 9-year-old, was abducted. Four days later, with the assistance of GPS, a cell phone, and Google Maps little Natalie was found by authorities who returned her safe and sound to her legal guardians. Since the end of 2005, cell phone carriers have been required to provide some way to trace calls to 100 meters or less. To accomplish this, global positioning technology has been integrated in cell phone handsets. Officer Neale … contacted the child’s cell phone provider seeking a way to trace the call. The company provided him with GPS coordinates every time the phone was activated. Keep the cell phone in a secure, hidden location at all times. Letting an abductor know about the location of a phone is a sure fire way to get in taken away or destroyed. When in danger, the phone will provide a very safe connect to the outside world. It will let the police and parents know where a child is – possibly saving their life. Keep the cell phone quiet. Again, avoiding detection is the most important thing you can do with your cell phone. If your ringer goes off or your phone beeps every few minutes because you got a voice mail your phone is going to be found out and taken away. At the first sign of danger, put the phone on mute and secure it. Keep the cell phone on. This is very important because this is the only way that the police can use the mobile phone to hone in on your location and to set you free. An “on” phone is key to your continued safety. If there is any doubt if it is safe enough to use the phone, don’t use it. Wait until you are very certain that you will not be discovered. Call the police before you call anyone else. They are best equipped to help you get out of your situation safely. In addition to these tips on how to use a kids GPS phone successfully, I also noticed some interesting information about child abductions in general. In this instance, the child was taken by someone they knew – their grandmother. In the majority of child abductions, children are taken by a close relative. I am not sure about this particular family’s history, but it sounds like the legal guardians of little Natalie Maltais were not her biological parents. There must have been some sort of row between the guardians and Natalie’s biological grandmother about how Natalie was being raised. This argument must have then resulted in the kidnapping of the girl to “save her” from her situation. In the end, what we really learn from this is that GPS for kids only really works if the children themselves are educated in the use of their tracking devices. Without the child being an active participant devices can be easily discovered and destroyed by unscrupulous individuals. It doesn’t matter if it is a GPS tracking watch, a kids GPS phone, or a child locator – if the device is found it is going to be taken. If you are looking for what program you can download for free onto your child’s cell phone then please take a look at some of the free cell phone trackers that are available for a wide range of mobile phones. There are new apps coming out all the time that could be leveraged to keep your family safe with something as terrible as this were to ever happen to you. Just remember that keeping safe is the number one priority for you child in this situation so keeping the phone on and hidden as long as possible is key. We all know cell phones are here to stay. You can’t walk 10 feet in any public place without seeing some parent, child, or teen talking on their cell phone. You can even go to ‘poor’ countries and find that many people have access to this type of wireless communication. But have you ever heard of a kids GPS phone that is designed specifically to help parents keep tabs on their children? A few years ago, cellular phone companies found out that busy parents needed a solution to their business problem. With the pressures of work and the need to get things done around the house, get kids to their activities, make dinner, and be sure that they have money for their future parents realized that they weren’t giving their children the time that they deserved. As a result of this they developed types of cell phones that have been labeled ‘kid phones’ for the functionality made specific for children of a young age. By keeping your child’s phone to the simple speed dial options you reduce the risk of them using the cellular device for non-necessary reasons. You don’t your child to have access to all the internet, text messaging, and camera features that a regular cell phone might have. They simply don’t need all of that. 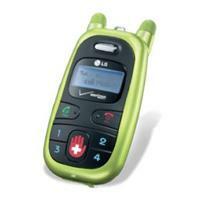 You want them to be able to give you call in case of an emergency or if they need to be picked up from school. That is all. The speed dial feature on kids phone seems to be the focal point of most the phone design. The screens are often just big enough to display who you are calling and if the call is connecting or not. Then there is the are the ‘send’ and ‘end’ buttons. These are generally large and obvious for your child. For many years these types of devices have been being utilized by parents to help ‘keep in touch’ with their children while parents go about their busy lives. During this same period of time, we have also seen an explosion in GPS technology in consumer electronics. The trickle down effect has finally made its way into cell phones and specifically created a new class of phone: the kids GPS phone. Cell phones are very similar. They receive signals from cell towers that often dot the urban landscape in a type honeycomb pattern. These signals tell the cell phone that they are in service, how strong that cellular service is (i.e. how many ‘bars’ do you have? ), and whether or not you are accepting calls at the moment (is the phone on or off?). When you talk with your phone, it is really acting like a very complex walkie-talkie where what you hear is being transmitted to you on one channel while what you say is being broadcast over another channel. One interesting side effect that this has is that phones can be used as a tracking device even if they don’t have GPS enabled. This is because the cell towers can measure how long it takes to get a response back from your cell phone between the different towers in your area. Once it has this information, it can use it in conjunction with the known position of all the cell towers to find your general location. Now this is probably not as accurate as a GPS phone, but it is still pretty accurate. Eventually some executive or engineer decided to implement the GPS feature on the kids phones that they were already developing. Perhaps it could be a good way to upsell some parents and get them to subscribe to more services while offering them an improved experience and more functionality. Either way, parents might want it and cell phone providers were going to give them kids GPS phones. These devices take advantage of both the cell phone and GPS technology that their small plastic cases contain. Unlike a kids GPS tracking watch, kids GPS phones are able to penetrate areas that can often be hidden from the watchful eye of the Global Positioning Satellites orbiting overhead. These areas often have some type of obstructed view of the sky overhead – such as a heavily wooded area or building – but can have access to a cell signal. While the location information is significantly less accurate when based on information provided from the cell portion of the kids GPS cell phone, it is still better than nothing all. Another key feature of these GPS devices is that they are also cell phones. While some GPS watches for children also have this capability as well, many child locators do not. There is something powerful in knowing that you can reach out and call your child whenever you are concerned about their whereabouts or safety. It is also nice to know that they can turn around and call you as well if ever they are worried or concerned. You are never more than a phone call away. Plans and prices for the kids GPS cell phone are fairly reasonable if you are serious about having this type of capability in something that you already have your child using anyway. You probably will not have to use it very often (most parents never need to), but if you feel like it will give you some peace of mind and supplement the safety of your family there is certainly some quality providers out there who can provide a kids GPS phone to meet your needs. Parents also have the option of leveraging current cell phones and turning them into tracking devices for free. Just download one of the many cell phone trackers out on the market and you can instantly turn a normal cell phone into a power tracking device. Just be sure that you have the data plan to cover it since this type of activity can be data heavy. But if you are already paying for a data plan why not make the most of it and install a tracker on your kids cell phone? Have you ever thought what you would have done with a GPS kids watch when you were growing up? I know I have. It probably would have been on of the coolest things in the world to be able to know that your parents could know at any minute exactly where you were, all thanks to that wonderful GPS kids watch on your wrist. I remember that when I was in Kindergarten being at church one Sunday with my spiffy Thunder Cats kids watch. I thought it had this special power that when I pushed a certain button it would call my brothers and we could chat with each other during Sunday School. I even tried it a few times believing that I could actually hear them and talk back. We were having our own little secret communications. Well, those childhood thoughts are now a present reality. A kids GPS watch is able to do exactly what my childhood mind fantasized about. At the click of a button, a parent or child will be able to communicate with the other through the modern marvel of GPS cell phone technology. All I wanted to do with my Thunder Cats kids watch was to talk with my brothers, but now in the case of an emergency a parent can activate the watch and communicate directly with their child. The peace of mind that this can afford a parent is pretty fantastic. They will know that if there ever were an earthquake, hurricane, tornado, flood, or other natural disaster while they were at work and the child at school that they would be no more than a click of a kids GPS watch away from talking to their child – providing the calming voice of reason that a parent should be. Sure, this type of peace of mind could be available on a cell phone, but chances are younger children could be irresponsible with a cell phone or it could be lost or not on their person when the emergency strikes. If they are out on the playground, their kids GPS phone won’t do them much good when it is in the classroom in their backpack. The children won’t be able to return to get their backpacks and will be taken directly to the safest place for them to be – either in the multipurpose room or the playground away from buildings. With a GPS for kids watch you won’t run into this problem as the device that allows you both to contact your child and to let them know that everything is going to be okay will always be attached to their wrist. There is some potential danger when it comes to this type of kids GPS device – namely ridicule. GPS kids watches can be a little bulky and offer some useful but cumbersome wrist lockdown technology that will prevent your child from taking off the watch (or in the worst case scenario, a predator from taking off the watch). Both of these combined may make the GPS tracking watch stick out with your child’s classmates. Any problems with this can easily be avoided if you take some very proactive steps with your child. The first step is to teach your child about GPS. They need to know a little bit about how it works in order for it to make some sense in the way that they look at the world. An older child can obviously handle a little more of the technical information, but a little child needs to know more about the basics and safety that they can feel when wearing it. Let your kid know that their watch is like a child locator that lets mommy and daddy know exactly where they are if something were to happen. Tell them that if they needed help all they would have to do it touch that button on their GPS kids watch and they could hear mommy’s or daddy’s voice that would be able to tell them exactly what they should do. Also tell them that their GPS tracking watch can be used by you to know exactly where they were, so if they ever felt scared or lost they wouldn’t have to worry as long as they had their watch on because you could always see where they were because the watch knew how to tell mommy and daddy exactly where they are. This will help let your child know that their kids GPS makes them safe. Then you can embellish things a little and give them the fantasies that I had when I was a little kid and that you might have had too. Build up the power and mystery of the watch and make it into this great peace of adventure that they can experience every day. Let them know that the watch is like a small kids tracker that you have put on their wrist to always be able to tell exactly where they are. This will help keep them safe as we have already discussed, but it is also about helping them have amazing adventures with their GPS . One day, make a log of what activities they do when they are out in the world and you are at work. After your child and you come home make it your goal to go over the map that you made using your child’s GPS kids watch with your child. Let them know how much you love them and have a ton of fun talking with your child, giggling, asking them questions about their day, and making them feel so special to you. Your child needs you before they need any GPS for kids. After they feel special because you are giving them your time and effort, reinforce the GPS tracking watch that they wear by letting them know that you were able to record their adventures today like you did because of that watch. Tell them that that child locator has the power to tell mommy and daddy exactly where they are every single day while they are at school and on the playground and in the lunch room and on the bus home from school. Let them know that the watch provides GPS tracking for kids to mommy and daddy and that mommy and daddy like this very much. This will help make your child like to wear the GPS kids watch and if they like thier GPS kids watch they will be able to deflect any criticism that might come their way at school. If they don’t like it and someone makes a joke about it they will be less able to deal with the emotional problem this brings up. They will feel ashamed and not like wearing their kids tracking device. But if they like it, when someone makes a joke about it they can respond with confidence and assert just how great their watch really is. GPS is nothing to be ashamed about, especially because of the safety and peace of mind that it provides. No school yard teasing should come in the way of that. If you are interested in more ideas on how to help your child appreciate their GPS kids watch we have two articles on this subject at GPS For Today. The first is Getting Your Child To Wear Their Kids GPS Tracking Watch – The Power of Fun and it is about one way to draw your child in to loving their GPS tracking watch. The second is GPS Kid Tracking Tip – Adventure is King which explores the potential that tapping into your child’s love for adventure can do for getting them to wear their GPS kids watch. Probably the worst part about being a dad is having to leave your wife and kids to go to work. IT is a strange game that modern man has to play in today’s society. Before the industrial revolution father’s spend a significant amount of time with their children, especially the boys. From a very early age the fathers would teach their sons the trade by which they made a living. When you went to work, your child went with you. Not so today. Our children go to work (school) just like we do and we have handed over the responsibility of teaching our children job skills to government institutions and professional baby sitters. There are ways to reverse this trend (home schooling), but most of them are more radical than many have the stomach or financial resources for. GPS tracking watches can help you bridge the gap that work inserts between you and your child. While using a GPS watch is not the best way to do this, for those that already own one or are planning on getting one it can be a nice bonus in addition to the fitness benefits of the GPS tracking watch. Here is how to use your standard GPS tracking watch to decrease the disconnect between you and your child: use your watch at work. Well, it’s not that simple, but that is the first step. The next phase of the plan is to share this information with your child in all the glory of 3D with Google Earth or Microsoft’s Virtual Earth 3D. By downloading your tracks onto your computer you are opening up the opportunity to show your child exactly where your day took you. For some of us who sit a desk all day long it might require a little imagination to get your kid interested. But if your occupation is one where you are constantly moving – like a postman, construction worker, plumber, or policeman – you will be able to relive your day to your child in vivid detail. You could mention how one particular house was a little stinky inside or that you saw a particularly nasty looking dog on that street or any slew of interesting or exciting things. You can also teach your child the finer points of your trade with the 3D map sitting in front of you on you computer. Did a particularly important meeting take you out of the office? Use this opportunity to teach your child something about what you do as the assistant to the regional manager. Teach them the basics of a sales pitch or show them why speaking well in front of a crowd is important. Kids learn by example and by mimicking the behavior of their parents. If they see you using your gps device they will much more receptive to using their own GPS kids tracker. You will also benefit from enriching the life of your child with all the years of experience that you have in your chosen trade. As they grow they will have a better understanding of how things work in the world and how to be a productive member of society. And besides, you could have a lot of fun in the process. Kids have a flare for adventure, especially boys. Put any boy in a room with a variety of toys they will eventually find themselves turning something into a weapon of some kind or imagining they are one of their favorite heroes from a book, TV show, or movie. Boys are born for adventure. For the wise parent, this often misunderstood quality can be harnessed into you most important asset in keeping your child safe. It is also a great way to get them to wear their GPS tracking device. The trick is to work with their adventuring spirit rather than try to snuff it out and turn them into little girls. Boys want to be special. They want to be seen as strong and courageous. There is something deep within them that longs to be filled with adventure. As a parent, you can lovingly guide them toward this in a safe and controlled way by utilizing a GPS kids device. After all, you want them to be safer in the event that the unthinkable would occur. The best way to get your child to buy into using their GPS tracking device is to associate it with adventure. You can do this in any number of ways, depending on what particular flavor of adventurer your child likes. Do they love Indiana Jones? Any good modern day archaeologist uses GPS extensively, often employing multiple devices get measurements within 5 cm. Are they a fan of the Mighty Morphing Power Rangers? No good Ranger goes without a locater so the rest of squad knows exactly where he is and can run to his aid when a foe approaches. Transformers, Bob the Builder, even Dora the Explorer all ‘use’ GPS for their needs. By associating the GPS with their favorite adventurer and offering them a chance to do the same you are using a built in incentive to using the device – getting to be like their hero. Now that you have spoken with your child about the device and wowed them with the association you made with their favorite adventurer it is time to reinforce the relationship between their GPS device and fun/adventure. You can do this in any number of ways. Take your child on a walk around the park while you go on an “adventure with them.” Be sure to bring a GPS device of your own with you. It can be your GPS tracking watch or Blackberry. A Blackberry or other internet enabled cell phone might be a better choice because that way you can access your tracking service associated with your child’s device. On your adventure stop at some point and make a reference to ‘needing’ to find exactly where you are at – to call in reinforcements, or to log the location of a valuable item, or to mark you way home. Take out your phone and access your real-time tracking service, displaying a map of your location. Show this to you child and let them know that you will be able to get this information at any time as long as they have their GPS device with them. You can do this a few more times if it will make your adventure together more interesting and fun for the both of you. By now your child should have had a good experience with you and their GPS kids device. If you want to, and you probably will because it was so much fun, you can always re-create this type of adventure scenario to acclimate your child to their device. This will help the child think positively about GPS technology and will help them be more aware of their device, thus reducing the risk of them losing it. In addition to using the a GPS tracking device, teach your child regular safety information. All the GPS training will do little good if they don’t know the basics. Avoid using fear as motivation for you child. It will turn out badly for them and for you. Instead, use positive thoughts, images, and incentives to achieve the behavior you are desiring. Your child will be healthier emotionally and they will probably do a better job meeting your expectations than if you used fear based tactics. GPS tracking devices have many applications in today’s society. We use them to help us better manage massive fleets (like municipal bus systems and tractor trailers), packages and other assets, as well as to track our children. GPS tracking devices are even beginning to make their way into the world of public schools. Bryan Adams High School is currently testing out a pilot program to help keep students in school and off the streets through the use of a GPS tracking device. Faced with a truancy rate in excess of 15% the school was loosing many of its kids and the money associated with their attendance. Strapped for a solution to this problem the Dallas Independent School District’s (Dallas ISD), which has the seventh worst dropout rate among large school districts according to America’s Promise Alliance, has turned to GPS tracking devices to get the children into class. These GPS devices, more like the devices used to monitor an individual on house arrest than a GPS tracking watch, were given to 6 students of the more than 300 who were sent to truancy court over the past year. The project cost the district $26,000, with the bulk of the money going to a case worker assigned to monitor and assist the children’s activities and to provide support to the families in keeping their child in school. This method is much more cost effective for the state when compared to detaining the chronically truant in a juvenile detention facility. Giving them a kids GPS can also provide some much need structure to a student’s life, increasing their ability to function in society. There are additional benefits to using GPS tracking for kids that are truant. Most students who suffer from truancy issues also have other issues that they deal with. These issue can range from the extreme to the minor and include behavior involving drugs or alcohol, gang involvement, family life issues, or all of the above. Last year, the GPS tracking system for truant students was used to locate a member of the trial group on the verge of overdosing on illicit drugs. Also last year, the GPS system helped case workers discover that a student had ditched school because he was thinking about taking his own life. In both instances, a GPS tracking unit helped those concerned with the well being of the students to track them down and provide the assistance that they so desperately needed. But not every one is enamored with idea of kids GPS used in schools. According to a New York Times article, one Texas state senator is opposed to the idea because the “ankle cuffs used in an earlier version were reminiscent of slave chains” (source). This could be a comment based solely on the political aspirations of a politician since the ethnic make up of Bryan Adams High School is predominately non-European. The majority of students are Hispanic American (53%), with African Americans representing the next largest contingent (32%). In addition to ethnic diversity, the school is economically disadvantaged, with 62% being classified as such. These demographic statistics could be at the heart of the senator’s comments or it could really be that the school district is out to reintroduce and perpetuate slavery through GPS. In all, the Bryan Adams High School and Dallas ISD should be applauded for their efforts in utilizing GPS tracking devices to help students to maintain their attendance, pass school, and get quality jobs that can help alleviate the poverty in the community. The use of GPS tracking technology to improve current systems needs to be further explored and tested in real life situations if we are to fully develop and utilize this powerful technology. Getting your child to wear their GPS tracking watch can be a bit of a hassle. They can be bulky and uncomfortable, giving your child every reason in the world not to wear it. This can defeat the purpose of getting the kids GPS device in the first place. What is even worse is that children often lose items that are not attached to their bodies, resulting in the device’s potential theft or, at the very least, the inconvenience of having to track it down in some out of the way place. Concerned parent, do not fret, there are real solutions to this child tracking problem. GPS is built with maps in mind, often integrating seamlessly with various mapping applications. By teaching your child to enjoy looking at maps you can easily motivate them to wear their GPS kids device. For example, to introduce your child to wearing a GPS tracking watch you take them on a fun trip to one of their favorite destinations. Let’s say that your child loves Disneyland and you decide to try this method out there. Before you go on the trip you introduce to them the idea of GPS tracking and let them know that all the places you go today are going to be tracked, but instead of having them wear the watch you wear it. You go about your fun trip as you normally would. As you wait in line at various attractions remind the child about the watch by saying things like, “I wonder where the Tea Cups are on a map of the world” or “It will be so fun to see exactly where we saw Mickey when we look at the GPS tomorrow.” The key here is on building excitement and anticipation around the watch. Once you have had a fun day at Disneyland (or on a any trip/event your child would enjoy) it is time to relive the entire experience once you have time to sit down with the tracking information. During this time you try and highlight the funnest parts of the experience while reinforcing the fact that the GPS tracking watch is what made it all possible. You might even consider using a tracking device that seamlessly integrates with digital photos – like the i-GotU. This way you can see all the wonderful memories and the location where you took them on a map afterward. Now your child has some significantly positive feelings about the GPS kid tracker. For some children this will be enough to get them to wear it. But if you want to solidify your child’s positive feeling toward the watch you may want to take the next step and take your child on another adventure – but this time they wear the watch. You basically do the exact same things – have fun, remind them about the watch, build anticipation to see what the watch recorded, relive the trip’s moments later – as you did the first time, but now the child will be associating the fun and excitement with them wearing the watch. This type of association is key to getting your child to buy in to the GPS system. Now that your child has some very positive memories with the device it is time to get them wearing the watch as part of their daily routine. You won’t have to fight with them during these times when you really want them to wear it the most because you have already taken a little effort on the front end to make it special. Keeping the watch special should now be the focus of your efforts. You can do this naturally by infusing your regular dialog with your child with references to the tracker. You could say things like, “I wonder where you played at lunch today, do you want to see?” Or you might say, “Yeah, class sounded really interesting today. Hey, that makes me wonder something. I wonder where Mrs. Robinson’s classroom is on a map. Let’s look!” These types of things will hopefully keep the fun of their device alive in their mind until the force of habit created by wearing the watch day after day becomes enough to keep them wearing it for some time. As you can see, with a little effort it is possible to build positive feelings around these sometimes bulky and awkward tracking watches. Not only will you create some really nice family memories on your trips, but you will also give yourself the peace of mind you were looking for in getting the kids GPS tracker in the first place. Both are invaluable to you as a parent and both can help make the world a safer, more happy place. So give this kids GPS tracking watch tip whirl and see how it works out for you. 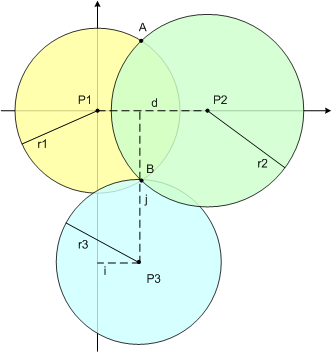 You are standing at point B in this picture (found where all three circles intersect). Let us imagine that you are standing out in the middle of nowhere and you want to find out where ‘here’ is. On your wrist is your GPS tracking watch, ready for instances just like this one. P1, P2, and P3 represent satellites in the NAVSTAR GPS constellation run by the US Government. There are twenty-four of these satellites orbiting approximately 12,600 miles (20,200 km) above the earth surface that are constantly transmitting microwave signals. At the same exact time, these satellites transmit a signal with information concerning their current location and the time that they were transmitted. The colored circles represent the path of the signal from the satellite at a specific time, let us say 8:45:03 AM, August 5, 1991. Your GPS tracking device is designed to pick up these signals and record the time at which they arrive. Because the signals from the satellites travel at approximately the speed of light, knowing the difference between when the signal was generated and when your watch picks it up will let you know the distance between you and the broadcasting satellite. This is a very simple physics equation (speed x time = distance). When you combine this with the known location of each of the satellites (this information is contained in the signal that your watch picks up) your GPS tracking device has all the information it needs to give you an exact location for where you are. Your GPS tracking watch will then do something with this new found information. If your watch is a data logger it will simply log your location in its memory and possibly give you a display of your longitude, latitude, and altitude. Data loggers are often simple devices that are used by bikers, hikers, and joggers to record their journeys, track the distances traveled for training purposes, or to build maps or guides if they are exploring new territory. This type of device has many useful applications, but unless you have a map with you in the middle of nowhere (Point B) this type of information will do you no good. If you are every stranded in some nondescript Point B I hope that you don’t have a data logger. Instead, you want a tracking device that is going to be a data pusher. What these GPS devices do is they transmit their position information at specified intervals to a central database. This database can often be accessed through the internet, providing valuable information to the search party looking for you. Common applications of data pushers include tracking delivery vehicles, locating stolen property (LoJack), or keeping tabs on an object’s or individual’s location. Data pushers are extremely powerful because of the information they provide – but with this power also comes significant risk of abuse. The most common form of data pushing devices are used for GPS tracking are cell phones. When teaching your child about their kids GPS, you are going to want to find a way to relate the information in a way that they can understand. It doesn’t matter what type of GPS you are using with your child – it could be a short range child locator, a GPS tracking watch, or even a covert GPS tracking device – you just need to find a way to give your child a way to wrap their mind around the idea. Grab a couple of paper plates out of your pantry. Draw a few satellites in the center of each paper plate. This will be a great time to explain what a satellite is and how they fly in the sky around the earth. You can make sure that they know that satellites make up the Global Positioning System (GPS). Arrange the paper plates so that they resemble the picture found above. Take out a ruler and measure the distance between each ‘satellite.’ Take the time to explain how this is important for the child locator that they get to use every day. Now explain that the child locator knows exactly where the satellites are in the sky around the earth. It can measure where the child is just like you did together with the ruler. Now take out your cell phone or your child’s GPS kids phone. Explain that their GPS device for kids works in the same way the phone does – it talks through the air to another phone. That is exactly what the kids GPS does – it talks through the air to someone else. And finally, tell them that the person that the GPS tracking watch talks to also talks to Mom and Dad. That is how you know that the child locator works and why you got it for them. Most importantly of all, you want your child to fell like they are safe with their GPS tracking watch and that it makes them valuable/special. This will give them a better understanding of the world that they live in and will enable them to be productive little guys. Posted on May 29, 2008 June 14, 2011 Categories WatchesTags gps kids, GPS Tracking, gps tracking device, gps tracking watch, kids gps, trilateration2 Comments on How Do GPS Tracking Watches Work?